Slack has been a big success. Companies have been switching from email, and other messaging and collaboration tools non-stop. We live in Slack at productboard as well. Slack is fundamentally a messaging platform and in its current form, it is probably the best tool to get done the job of communicating internally with your colleagues and staying up-to-date on what is happening. That’s the one job where Slack excels, and it is a hugely important job with a huge market. But it isn’t the only job where messaging is relevant. The issue is that while the underlying activity and feature of messaging is relevant for all these jobs, Slack’s current product is far from optimal as a solution for such jobs. Whereas Slack is far better than any other solution out there for the job of team communication, it falls short for the other jobs. For one, it’s very difficult to have orderly discussions with other members of the community in Slack. Imagine inviting a hundred people into one room in real life and letting them talk over each other. There’s a limit to how many people can have a productive discussion at the same time. And if you miss a comment submitted while you’re not attending to the conversation, it will quickly be lost from view, perhaps never seen by those it was intended for unless excessive @mentioning is used. Structured forums in combination with messaging would be better. The pitfall of using Slack for customer support is how unactionable it is for customer escalations. Core jobs in the customer support realm include routing tickets to others, keeping track of ticket status, and identifying blockers to closing out a ticket. These workflows are all important for ensuring tickets are solved in a timely manner (and not forgotten altogether! 🚩). 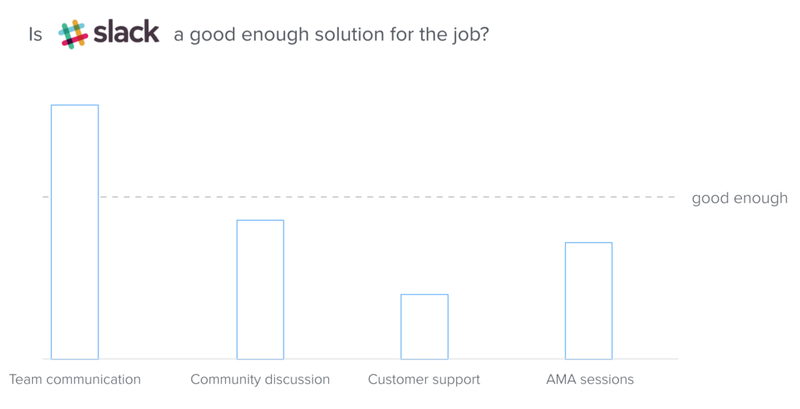 That’s why @intercom has grown so rapidly — because it succeeded in combining messaging with support workflows. The story is similar for Ask Me Anything sessions. Watching an AMA on Slack is like being at a conference and watching hundreds of people scream questions at the guest speaker at the same time. In its current form, Slack simply fails at performing these auxillary jobs… no matter how effective it is as a messaging app for teams. At the moment, they are rightfully focused on the core job of team communication, as they should. Only once the platform is mature and customizable enough will it be time to consider branching to other jobs as well. In the meantime… let’s not confuse a good solution for one job with a good enough solution for another!